Channel Master 7778 pre-amplifier, fed into RG6 Quad-Shield cable. I provide the antenna setup and God provides the atmospheric conditions. Last night I watched the 11pm news on WBTV, then a few minutes of a program about Lake Mead on WCNC's subchannel. Distance to WBTV's 2,000-ft tall tower: 181 miles. What is amazing is that, with the antenna aimed at Gaston County, the tuner of my Sony TV was detecting something on channel 11, though the signal was not strong enough to view. I verified that WTOC-11 in Savannah was not coming in strongly enough to be what I was getting. Surely it could not have been WTVI! No way that was WTVI. Not even god can view that station. I will drive up to China Grove today and check on it. The remote control says 100% power, but we can not pick it up because of WYFF. Yes, I am aware of the work that was done on RF50 WAXN Ch64-1, and the fact that you are protecting the signal of WFMY Greensboro, with the main lobe going 215 degrees. However, since there's been no change on the translator, RF36 WAXNTV1 out of China Grove on CH64-7, I find it very interesting that I am experiencing these results. As previously mentioned, I have 'consistently' received a signal from RF36 (day and night) for the past 1/2 year since I've had my antennas. This changed (as of about 6 days ago now) where I get nothing at all (day or night). Just that blank screen with occasional flashes of light (not pixelations). Thanks Ted for any additional feedback on this situation. VHF does have a better chance of reflecting off the atmosphere. I do agree however that WTVI is a bit tough to pick up, though I get it fine on my homemade antenna, basically a 28 inch dipole. That station is having money problems. I hope they manage to pull through it as they bring some pretty unique programming to the area. Public TV nationwide is having economic issues. But PBS is also available from UNC TV and SC ETV. I get 3 SC public channels, 29, 49, and 38. And 2 from NC, 33 and surprisingly 17. The views expressed here are my own and do not necessarily represent those of ABC, CBS, CW, FOX, MeTv, or AntennaTv; my employer; or its parent company. Nor my wife for that matter! PBS still presents by far the best TV programing in the country, cable or OTA. Not even in the same ball park with your FOX programing. I think he is refering to the business model of public TV moreso than the quality of programming. Government should be concerned with providing essential services rather than operating an unprofitable business. Of all the stations i pick up OTA, WUNE is the most impressive because of the distance(68ml)& being WAY outside the sweet spot of my antenna's. Ether i have line of sight or the whole grandfather mt thing really helps. With the limited programming we OTA'ers have i for one enjoy what PBS brings to the table. I can also see WUNE with my outdoor Winegard. However, it only works if I aim my antenna at about 270 degrees. But I usually don't try to see it since I can watch PBS on either WUNL W-S or WUNG Concord without rotating my antenna. Ted, I am not sure if you found any problems or not with the China Grove translator. I didn't have a chance during the day (today) to look at TV. However, I can say that as of tonight (after six days), I now can see RF36 WAXNTV Ch64-7. So hopefully it is back to normal. It's always been a very reliable translator (day and night) outside of the past six days. I wanted to let you know. I will agree with you on that one. If I had to choose between PBS channels and all the rest, I would choose the PBS channels. And yes, everyone knows that UNC PBS is out there, but I prefer WTVI. WTVI news coverage is the best in the business. It beats the hell out of ANY of those Charlotte stations where all they talk about day after day is their budget. Bingo. Like a real Education for our children, and not by watching PBS Kids on TV. The 64.7 stream on WAXNTV1 has been corrected. The 9.7 and 9.8 were always working. I am in the process of being able to monitor China Grove from Charlotte. I actually don't watch the PBS portion that much except for the cooking shows which, IMO are far superior to anything on Food Network. (If you actually cook) The reason I like WTVI is for CreateTV and MHZ Worldview on their two sub-channels, 42.2 & 42.3. It's nice to actually have some real news. If you have cut the cable, these channels offer up some nice alternative programming. I agree about the part above about kids and these programs. Charlotte is lucky to have 3 different PBS affiliates available. It might be unique in the Carolinas for that. Strictly for PBS, I think SCETV does the best job of the 3, followed by WTVI. WUNC(G) are pretty poor in comparison. They are basically a Raleigh TV station that just happens to transmit to the rest of the state. Almost nothing on there about Western NC. IMO are far superior to anything on Food Network. (If you actually cook) . That channel needs to be banned at my house. All it does is get me back in the frig at 930 at night and is making me widescreen. Location: Where ever I am is where I am. Starting next Monday, Capitol Broadcasting's CW affiliate in Charlotte, N.C., will offer the Tribune Broadcasting classic TV diginet on a subchannel. Tribune now claims coverage of more than 50% of the U.S. for the network, thanks mostly to its carriage on 19 Tribune stations. Capitol Broadcasting’s WJZY Charlotte, N.C., next Monday (July 25) will join the growing lineup of stations airing Antenna TV, Tribune Broadcasting's classic TV multicast network, Tribune announced today. In addition to WJZY's ch. 46.2, Antenna TV will be available in the Charlotte market on Time Warner Cable's ch. 147. The station is negotiating with other cable operators and expects to achieve full cable carriage in the market "in the near future," according to Tribune. Antenna TV debuted on Jan. 1, 2011 and has expanded coverage to more than 50% of the U.S.
Much of that coverage comes from Tribune's own stations. Antenna TV airs on 19 Tribune properties, including WPIX New York, KTLA Los Angeles, and WGN Chicago. WJZY broadcasts The CW on its main channel. All opinions expressed (unless otherwise noted) are the posters and NOT the posters employers. The poster in NO WAY is/will speak for his employers. "Arguing with an engineer is like mud wrestling with a pig. After a couple of hours, you realize the pig likes it"
AMEN to both Tyler and bdfox - if PBS programming is so great, then they should survive just fine without a government subsidy. I mean, why would government throw money at something that doesn't work - they spend their money responsibly like I do, right? Anyway, PBS can still operate non-profit and get grants from businesses and viewer contributions. Or, they can go commericial. Yes, the 9.7 and 9.8 have always been working with no dropouts or pixelations at any time (day or night). As for the 64.7 stream off WAXNTV1 from China Grove, I've had the station back since yesterday. However, it's still acting funny. For example, right now my signal meter on my Panasonic 37 inch LED reads 85% on 64.7. However, while it's reading that amount, I'm getting pixelations and dropouts. Before yesterday (for a six day period), it was no picture at all on 64.7 (just brief flashes of light--not pixelations). Now, the picture is back at 85% but instead of flashes of light on a blank screen, it displays the picture with quite a bit of pixelations. Again, this is weird given that an 85% signal strength normally means a solid picture; and the fact that I never saw any of these issues up until last week on this translator for 64.7. Thanks a bunch for your trip up to China Grove as well as anything else you can check into about this signal when you get time. Has anyone noted the extra commercials of late cutting into airtime on 18.3 (ME-TV)? Even the credits of some programs have disappeared (and even bits of show intros). I enjoyed viewing the credits because it gave me a chance to do a Google search on the stars of yesteryear. I've actually seen some of the programs, themselves, trimmed a bit. Part of the nostalgia of ME-TV is being able to see the shows from intro to ending credits. In addition, editing out these portions hurts the continuity of the lineup...at least in my opinion. I plan to contact the station and express my views. There are no extra commercials being inserted into MeTv nor are shows being trimmed. (at least not intentionally) What you are seeing is due to a software bug in our automation where it often fails to send a "return to network" command. The tech support guys have logged in remotely and seen where the command is issued but does not execute. They have the software developers looking into the issue, but until they find the cause it may affect the shows at times. This station does seem to put out an impressive signal, as I normally receive it here in GVL SC as well. And that is off the side of the antenna which is pointed towards Dallas/CLT. Not sure about their power level, but being on a tall tower from the mtns surely seems to help. Is the WTVI repeater, translator, or whatever it is, in Hickory having a problem? The four WHKY signals come in strong 99.9% of the time. The three WTVI channels seem to be having some problems. The WTVI Problem is with ch 11 in Johnson City, TN. With the current weather they are putting signal into Hickory on channel 11. The Hickory WTVI transmitter picks up off air from the Charlotte site. WJZY has AntennaTV on 46.2 as of this morning. 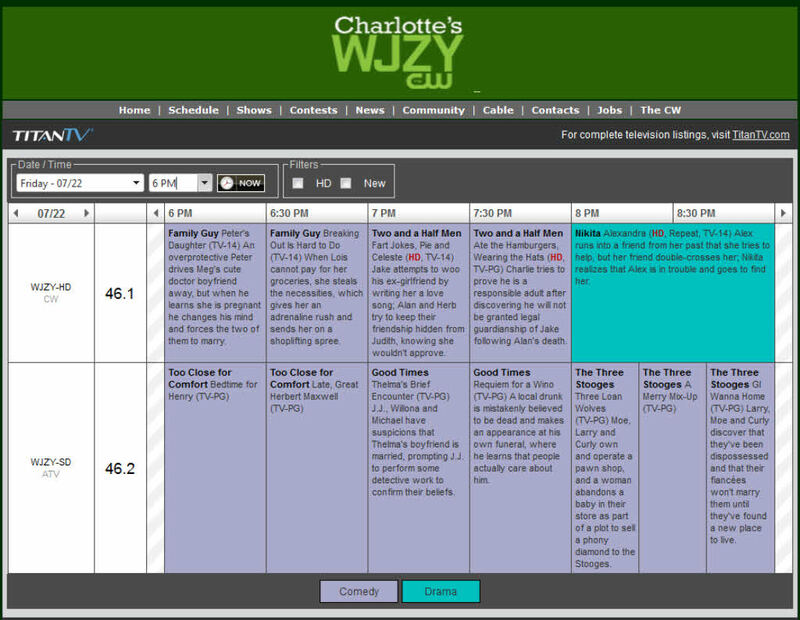 And, TitanTV now has the listings for WJZY 46.2 ATV. So far, I haven't got the 7-day line-up on TVGOS on my DVR. 64.7 is back up..again. We are having issues receiving WAXN 64.1. We will be looking at a pre-amp and maybe antenna change. I have noticed that Reverend Rob is back (minus the reverend) from Apple Auto Sales on MeTV. His commercials always made me laugh and it's good to see him again. He is a bit of Charlotte TV history.